In Pakistani fashion industry, Mina Hasan is considered as a talented and well-known fashion designer. In 2002, she started her fashion designing career. Casual wear, formal wear, semi-formal wear and prêt wear are the main product lines of Mina Hasan. The designs in all the collections by Mina Hasan are stylish and elegant. Moreover, the fancy work on the dresses is done by highly skilled craftsmen and all the dresses by Mina Hasan are made from high-quality fabric. The stitching style is excellent of Mina Hasan collections. According to season and festival, Mina Hasan showcased many collections every year. Mina Hasan has launched its exclusive and latest party wear collection 2013 for women, recently. This party wear collection 2013 is very stylish and elegant. Long shirts and frocks with trousers are included in Mina Hasan party wear collection 2013. These party dresses by Mina Hasan are elegant and stylish. According to latest fashion trends, all the party dresses by Mina Hasan have been designed. For making this collection more attractive, Mina Hasan used bright and dark colors. In the form of photoshoot, this party wear collection 2013 has been showcased. Ayaz Anis was the photographer. 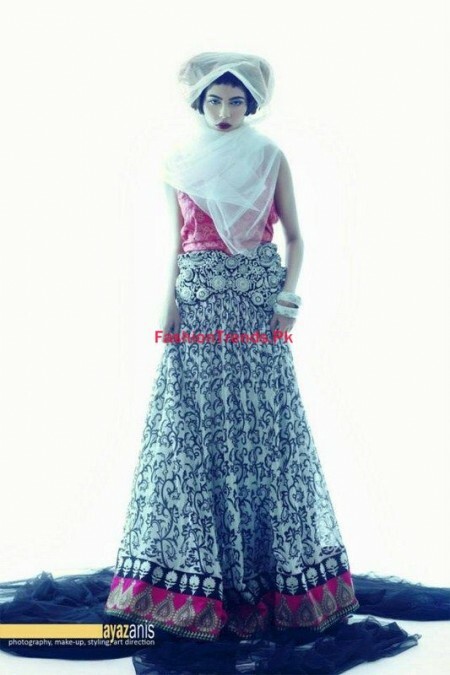 Amna Babar was the feature model. Hairstyling was done by Sabrina and Natasha was the makeup artist.